The medications I received from the pharmacy last week helped to improve my symptoms somewhat. I have to say, I love those fizzy aspirin tablets. They work like nothing you can buy over-the-counter in the U.S. However, as my headaches, sore throat and congestion are subsiding, I am still left with a very uncharacteristic weakness and fatigue which are preventing me from doing anything. So far I have spent most of my time here in France sleeping while Norman has been busy taking care of me and the daily chores. On Friday, we decided it was time for the next step — a trip to see a doctor. Unfortunately, our French has not improved to the degree that we feel we can really explain health conditions well. Not to worry — our hosts had assured us in their introductory material that there was an English-speaking doctor in the area and we had her name and number. As with anything you set out to do here, it’s just not that simple. Thankfully, in our house there is a phone available for local calls. I called the number for the doctor and was instead connected to the Pompiers (the fire department). Our short French exchange revealed the fact that the doctor no longer practiced here and they did not know of one who spoke English. We began to look up local doctors online only to find very little information eventually learning that doctors in France are not allowed to advertise nor post much information about themselves except for an address and phone number. Finally, we realized there was a phone book we could reference. With the predominance of cell phones, we haven’t had a landline at home for over 10 years and never use a phone book so this simple solution didn’t occur to us at first. After several phone calls, Norman found one doctor who spoke English but was told he wouldn’t be in until Monday. I always tell my Spanish students that the most difficult thing to do is speak on the phone in your new language and, believe me, it is! This morning we had our first official experience going to a doctor in France. I had read a couple of articles expats had written about their experiences so we were fairly well-prepared, but it was definitely different. We entered the office without an appointment and spoke to the receptionist. Based on very little information (no papers to fill out or forms to sign), she directed us to the waiting room where there were only two patients ahead of us. We had read that it was polite to greet everyone in the waiting room with a simple “Bonjour” and so we did. Generally, it is unheard of to acknowledge other patients in a waiting room in the U.S. After about 45 minutes, the doctor himself came out to greet us and usher us into his office. As it turned out, the doctor’s English was about as good as our French. Nevertheless, between the three of us and some key phrases I had noted on my phone, we were able to make ourselves understood. I had also brought along a copy of my medical record I was able to download and print thanks to the computer and printer available here in our house. In France, the doctor’s office and exam room are one and the same in this case slightly divided by a partial wall. I proceeded to the the exam table where the doctor took some vitals and checked a few other things. Then we returned to his desk where he scribbled out some illegible instructions. He handed me the paper, told me to take it to the lab to tomorrow for some blood tests, get the results, and come back to see him afterwards. He sketched a rough diagram on the back of his tablet saying that the lab would be easy to find — no name or address, just some significant landmarks. We decided to hunt it down today rather than be baffled trying to find it tomorrow. Lastly, the doctor wrote us a quick bill for €23 ($25) which we paid him directly in cash receiving change as necessary, and with a few “Merci’s” and “Au Revoir’s”, we were on our way. In the end, the doctor had spent about 30 minutes with us and was in no rush to get on to his next patient. It was all so amazingly straightforward and simple, and best of all, inexpensive. Stay tuned for the next installment in the continuing saga of getting medical care in France. One thing I have gained from almost 40 years of teaching is an immunity to almost every “bug” the kids bring to school. Consequently, I (almost) never get sick. In fact, I can’t remember the last time I was ill with a cold or the flu or anything of that nature. As luck would have it, the end of the school year and the accompanying exhaustion plus a long flight to France in close proximity to so many people has brought on a few common cold symptoms I haven’t experienced for a very long time. After a few days of trying to fight them off with sleep and ibuprofen, the usual progression of sore throat, headaches, and runny nose have prevailed. So I knew it was time to visit the French pharmacie. You may remember that last year in a previous post I wrote about healthcare in France. When you get sick, the first place to visit is the pharmacy where a licensed pharmacist with many years of training will advise you on what medications you should take for your malady. Many times this is all you ever need. This is nothing like the service or knowledge that is available in a U.S. pharmacy. I experienced this during last summer’s trip to France when I regretfully fell and sliced the palm of my hand open. It was a Saturday and we knew that doctors and clinics would be closed. So we went into the nearest pharmacy, showed the pharmacist my cut, and were provided with all the necessary items such as bandaids and antiseptics plus instructions for treatment all for a fraction of the cost in the U.S. Normally, you won’t proceed to see a doctor until you have exercised this option and your situation hasn’t improved. Even then, the cost of seeing a doctor is still far below American prices. In preparation for today’s visit to the pharmacy, we looked up all the French phrases we would need to explain my discomfort. Then we stopped in to a convenient local pharmacy. They are located on just about every corner and very easy to identify with their flashing green crosses. After describing my symptoms to the pharmacist the best that I could, she brought forth three medications — one each for headache, sore throat, and congestion. For about 15€ ($17) I was all set. Once I got home, I had to read all the precautions in French (where all my studying this past year paid off) and figure out how to take each of them. The pain medication, a form of aspirin, was actually a large effervescent tablet to be dissolved in water somewhat like Alka Seltzer. It was surprisingly pleasant to drink and thankfully took effect in about 30 minutes. The nasal spray for congestion had a similarly rapid result. Hopefully, with a few more days of rest, I will be able to enjoy the rest of our summer in France. One of our goals this summer, was to experience living rather than vacationing in France. Though my illness has definitely been unpleasant, the flip side is that it has forced us to spend at least a week just living a normal daily life without spectacular events to distract us from reality. Just like any move, short or long, there is a certain amount of work involved in getting settled in to your new home. Even before when we moved from place to place in France staying for only a week at a time, we did this in a more condensed fashion. Since we will be staying in the same house for two months, we have been able to take our time getting settled. Instead of having to figure everything out in one day, we’re spending the first week relaxing, resting, and taking stock of our needs for the summer. Before we returned home last summer, I made a food list and a miscellaneous list of things we might need to purchase when we arrived depending on what was on hand in the house we were renting. When we arrived, we were pleased to find that many of the items on our lists were already here. On Saturday, we purchased a few basics beforehand to get us through our Sunday arrival when pretty much everything is closed. Once in the house, we took inventory and prepared to go to our favorite nearby shopping mall on Monday. Among other things, this mall boasts a gigantic Auchan super (duper) market. It literally has everything you could possibly want… if you can find it. For someone who used to love shopping so much, I am always surprised at how exhausting it is to make this first major trip to the store. We decided to divide and conquer, so I took a shopping cart for my part of the list and Norman used a rolling basket for his. Due to the fact that the store is so incredibly large and we cannot message each other on our phones when we get separated, we chose a central meeting place and time — harking back to the pre-cellphone days of taking the kids to Disneyland and letting them go off on their own for a while. This worked fairly well, but it is still easy to get lost. During one rendezvous at our meeting place, an elderly woman approached us and began speaking to us (in French, of course) about the fact that each of us had a shopping cart. At first I thought she was reprimanding us, then I realized she was making a joke of the fact that the husband had the smaller cart and the wife had the larger one. She was very sweet and even though we explained that our French was limited, she continued speaking to us in a very friendly manner and finally wished us “Bonne Vacances”. After about an hour, we had picked up most of the items we came for and agreed we were spent for the day. What is so exhausting about this process is that, like in the U.S., there are so many brands and we really aren’t familiar with any of them. This leads to a lot of price-checking and label reading. In addition, things are not necessarily organized in the same manner to which we are accustomed often requiring much searching for one item. For example, who would have thought clothes hangers would be across the aisle from house paint? In the end, we had a salad spinner and good knife for the chef plus extra ice cube trays and hangers and a myriad of food products including the requisite bread and wine. We were ready to check out and head home. Today we made another trip to a different store in attempt to complete our list though it seems there is always something more. Tomorrow we plan to get up a little earlier to enjoy the bounty of the farmers’ market in Périgueux. It’s time for some farm fresh, local ingredients. Sometimes you have to sacrifice for a while in order to achieve what you have planned for. And so it goes for today. Having arrived at the San Jose International Airport three hours ahead of our flight as suggested in order to have time enough to get through the TSA security check, we boarded our plane and headed to Salt Lake City, Utah for the first leg of our journey. After an hour layover, we were on our way to Paris’s Charles De Gaulle International Airport. In the news of late has been the contentious struggle in France between the major labor unions and the president and prime minister as a labor reform proposal that has been in the making for the last three years is about to become law. The result? France’s labor unions have been striking and marching for several weeks and many services (mostly in larger metropolitan cities) have been affected. So upon our arrival to Charles de Gaulle, we encountered one of the largest and busiest international airports in Europe to be virtually empty. And while we had only an hour layover before our connecting flight to Bordeaux, after boarding we sat on the tarmac and waited for more than two and a half hours before finally being cleared to take off. Seems that we got caught in the midst of the dispute which seems all too frequent in France. Add to that the bumper to bumper traffic we endured after we picked up our car in Bordeaux as we headed out to our weekend stay at the beautiful riverside Château Courtebotte less than an hour’s drive, we arrived more than three and a half hours late. We had dinner reservations at the chateau for which we were almost an hour late. So, we had accepted the fact that we might be going to bed not only exhausted from 14 plus hours of travel and only two hours of sleep, but that we would be going to bed hungry as well. Ah… but thanks to the French custom of not having dinner until at least 8:00 p.m., we were able to join four other guests for drinks and appetizers. One of the joys of travel is meeting people from all over the world and this small group was no exception. One of the couples was from Australia, while the other was from England. Interestingly, overall, everyone was of like mind in that we shared similar opinions on a variety of topics. Our hostess who was French added another dimension to the conversation. 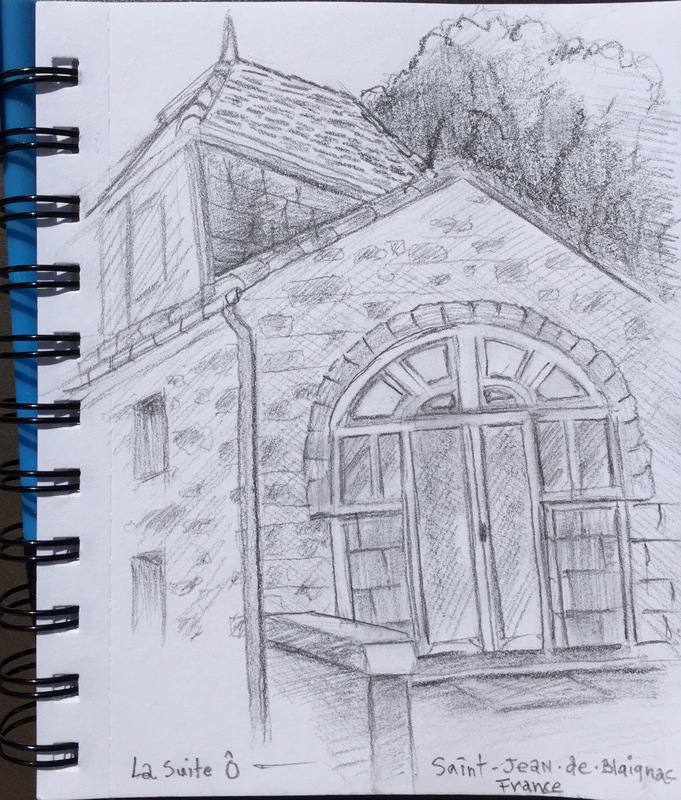 We enjoyed exploring each other’s opinions as we sipped on a wonderful locally produced Crèmont wine and a light and tasty pastry consisting of many crisp layers topped with a light coating of powdered sugar and poppy seeds. After an hour or so, we withdrew to the dining room where we started a wonderful meal with cream of zucchini soup and and fresh cantaloupe balls. This appetizer was enjoyed with a Bordeaux Blanc Sec white wine of excellent quality from the same winery. Next up was the main plate of chicken breast medallions in a delicious rosemary reduction sauce with fresh sautéed vegetables and a petite skewer of tiny finger potatoes and bacon. Following was a sampling of local goat and sheep cheese and fresh sliced country bread and a Bordeaux Superior Rouge wine that was decanted in what looked like a large glass goblet. For the finale, a serving of home made panna cotta topped with sweet fresh strawberries. Tiny demitasse cups of coffee and tea finished off the meal. And all during dinner, we continued a long and interesting conversation. In the U.S. these days, products are on sale every day. We have become rather complacent about it. There was a time when sales were limited to holidays and certain times of the year. The products were truly on sale. Stores didn’t bring in low quality items specifically for the sale or mark items up just so they could mark them down. When I shop sales, I always ask myself three things — Is this a quality item? Is this a fair price? Do I love it? I never buy anything simply because it’s on sale. 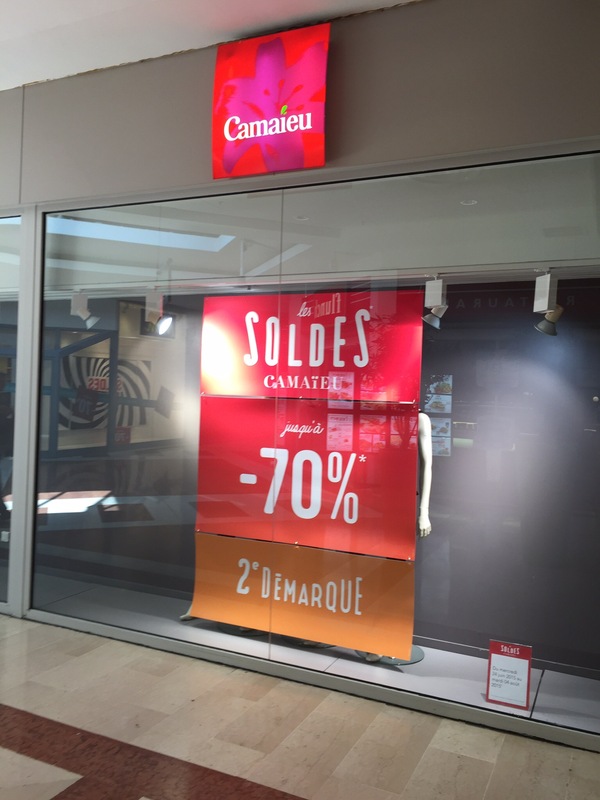 Sales in France, known as les soldes, are completely regulated. There are only two sale periods — winter sales and summer sales. Winter sales occur between specific dates from January through February. Summer sales occur from mid-June through the beginning of August. Stores are not allowed to bring in special items for sale. They can discount stock from the previous year as well as lines that were over-produced or have been discontinued. In more touristy areas, they are even allowed to stay open on Sundays. Online sales are gaining in popularity with offers such as free shipping. Discounts range from 30% to 50% and sometimes go as high as 70%. This year, the summer sales span from June 22nd to August 2nd. One of the benefits of traveling to France during the summer is that the sales are in progress for most of our trip. Last summer we took advantage of the soldes to purchase cooler clothes than the ones we had packed as it was a fairly warm summer compared to our previous experience in 2012. Norman discovered some French styles (men’s capri pants) not common in the U.S. We had to practice our French shopping vocabulary and were forced to figure out how to ask things like, “Where can I try this on?” In addition, we had to figure out our sizes something we completely forgot about being different. Thank goodness for those converter apps! Since our phones only worked on wifi, the first day we decided to do some serious shopping, we had to return to our apartment and do some research and then go back to the store the next day. Up till now, we have attempted to travel with only carry-on luggage but weight has become an issue. First, you have to be able to heft that bag over your head into the increasingly smaller overhead bin — a task that is more and more of a challenge as you get older even with all those weights you lift at the gym. Secondly, the airlines have gotten serious about weighing those bags and you are limited to 26 lbs. The way I pack, I can easily put twice that much in a carry-on bag. So now we are just going to take our chances with some new, slightly larger suitcases that we will check — weight limit 50 lbs. Heck, if they don’t make it to our destination, we can always shop the soldes.